Monarda fistulosa and Monarda didyma are native to eastern Canada and the United States. It’s late July, a high-summer evening in the garden. I close my eyes and listen to the gentle hum of bumble bees and honey bees. The heavy aroma of day lilies mixes with the lighter scent of phlox. I brush my hand on the foliage next to our patio, releasing a different scent: the tangy mint of monarda. 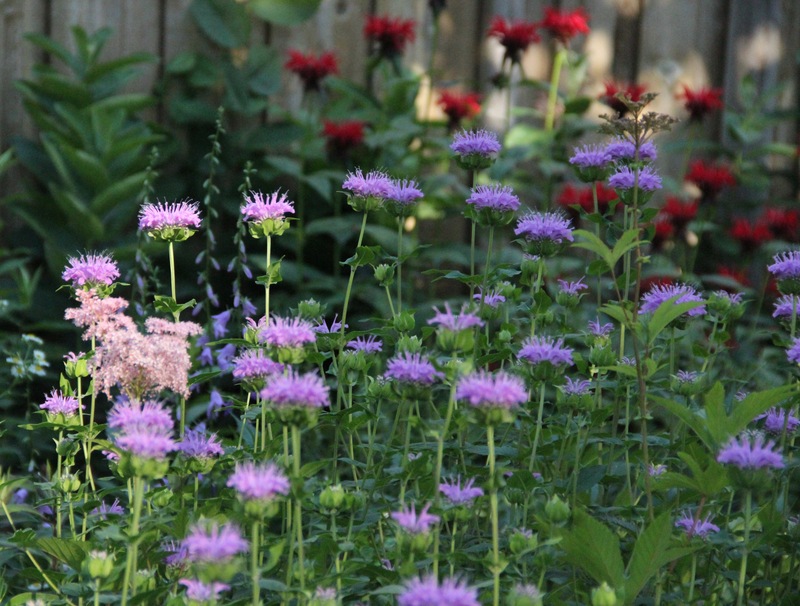 Two kinds grow in our garden: fiery red Monarda didyma and lavender-pink Monarda fistulosa. Also known as bergamot, both are native to Minnesota and to much of the eastern United States and Canada. Ten or more years ago, I found lavender monarda growing next to our cabin driveway. That autumn, I brought home a small portion and planted it. 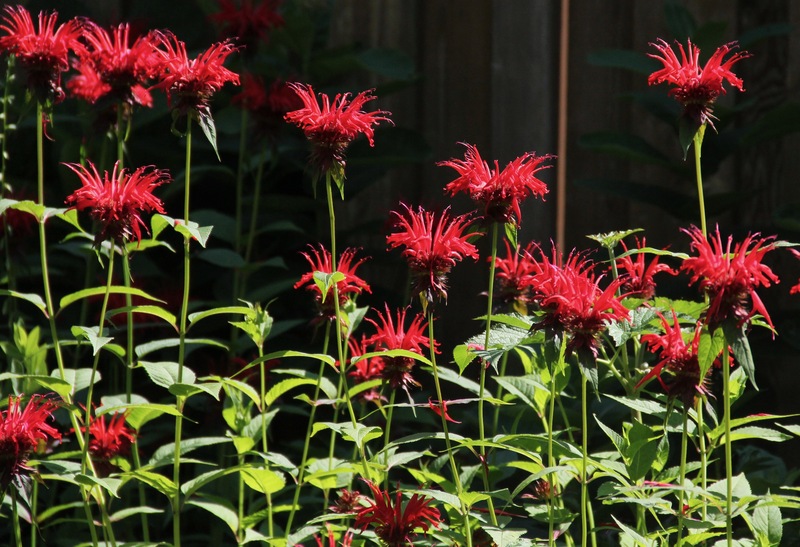 A few years later, I purchased the red monarda at Leitner’s, a local garden center. Both flourish as long as late winter and spring aren’t too wet. Bright red M. didyma smells more spicy than the pink M. fistulosa. Monarda belongs to the mint family, but is much taller and better behaved than many of its minty cousins. Look closely and you’ll see mint characteristics: square rather than round stems, tubular flowers, opposite leaves and of course the wonderful minty scent when one brushes against the foliage. Besides monarda, there are other names for the plants. Bergamot applies to both species. Oswego tea and bee balm apply to the red M. didyma, but the term bee balm is also loosely used for M. fistulosa. 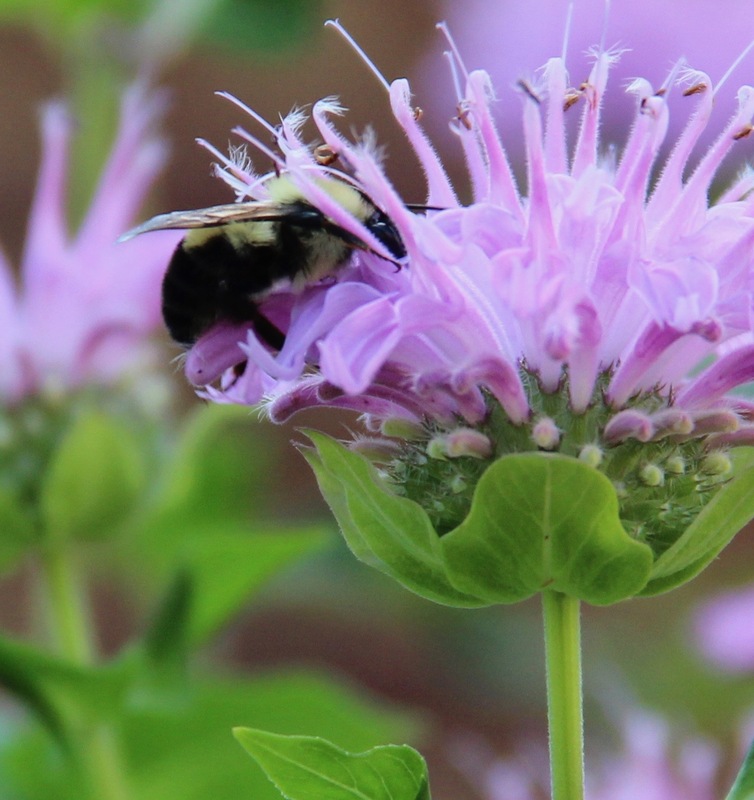 I thought it referred to how happy the bees are when they’re in the monarda, but according to a book about wildflower lore, a salve or balm was made from the leaves to treat bee stings. Monarda plants also were used by many Native American people to treat headaches, abdominal problems, colds and other bronchial issues. Both species were used as a tea substitute in the American colonies after the Patriot Sons of Liberty dumped 46 tons of British East India Tea into Boston Harbor in December 1773. Bumble bees (Bombus spp.) prefer the lavender-pink monarda in our garden. Their long tongues can reach the nectar in the deep, tubular flowers. A honey bee (Apis mellifera) flies in to drink the nectar of Monarda ‘Jacob Kline’. They favor red monarda. Monarchs, fritillaries, red admiral butterflies and hummingbird clearwing moths nectar in both species of monarda. Goldfinches peck the seed heads of the lavender monarda and hummingbirds visit the red ones. 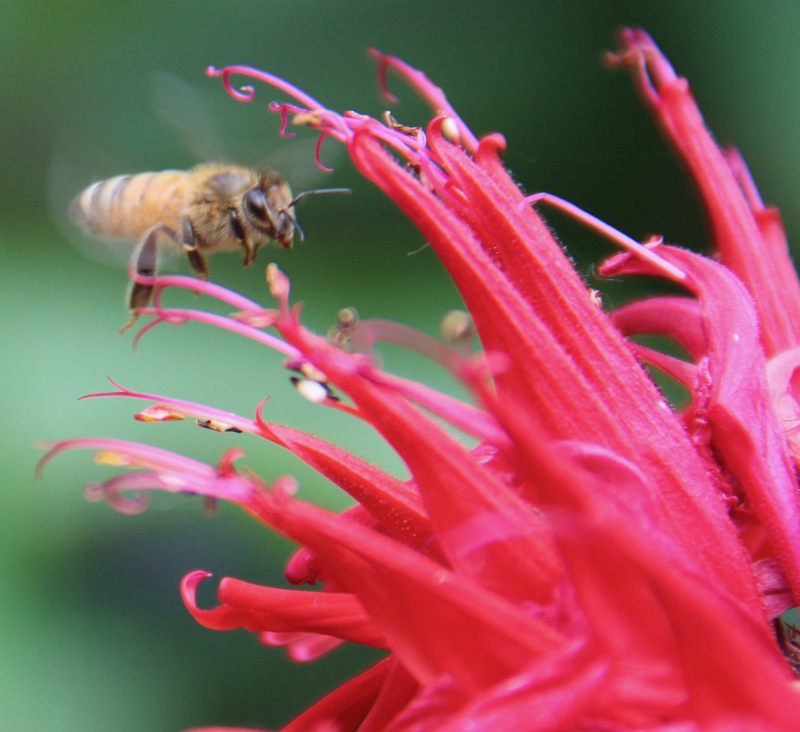 I’ve noticed that honey bees nectar almost exclusively in the tubular flowers of red monarda. Bumble bees, though not as fussy as honey bees, seem to prefer the pink — and sometimes they’ll take a quick nap on a blossom! 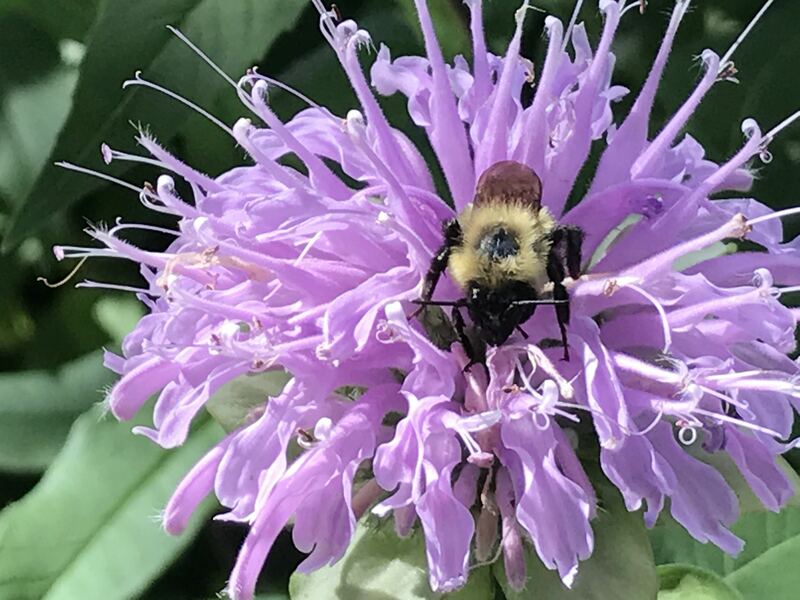 Bees lack a photoreceptor for the color red, but according to “The ABC’s of Bees,” some red flowers, including bee balm, have ultraviolet coloring mixed in, which makes them appear blue and inviting to bees. Also, like humans, bees are attracted to scent and perhaps honey bees prefer the spicier scent of the red monarda. As the sky darkens and the crickets begin chirping, I look again at the beauty of bee balm and, like the bees, enjoy the spicy mint aroma before I go inside for the night. 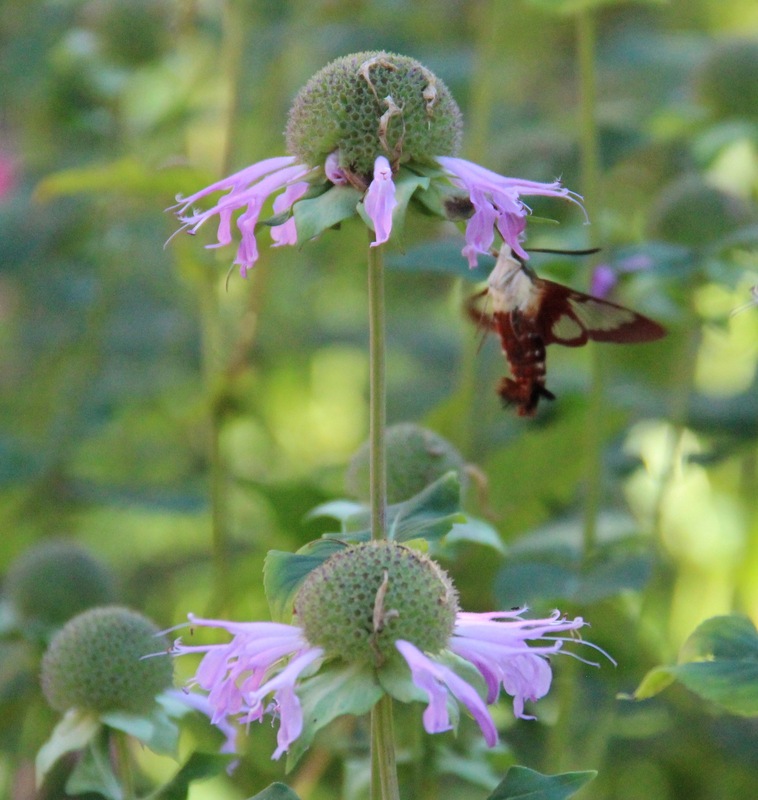 Hummingbird clearwing moths (Hemaris thysbe), like their namesake, nectar in monarda’s tubular flowers. 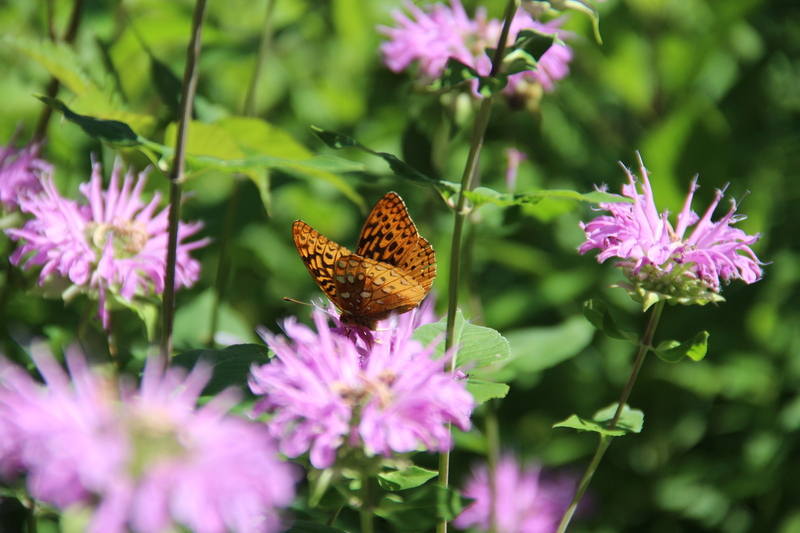 A great spangled fritillary (Speyeria cybele) nectars on pink bergamot. 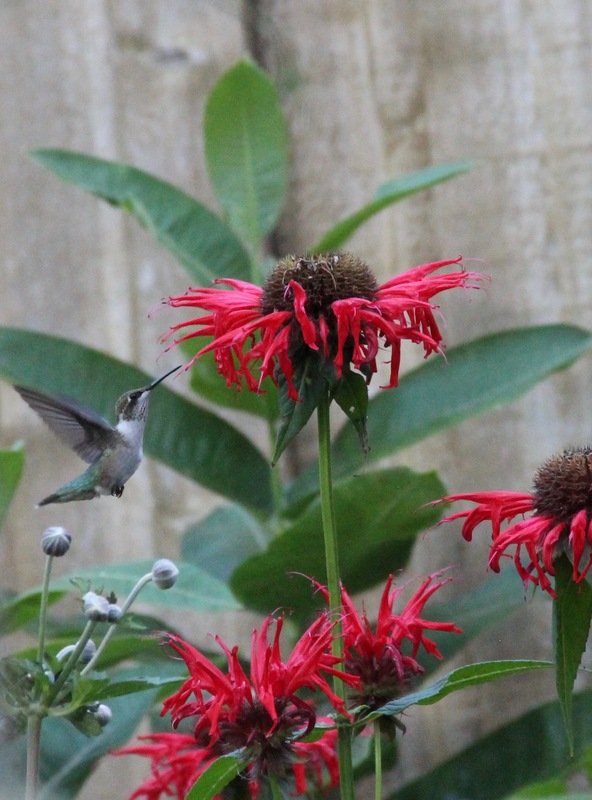 Ruby-throated hummingbirds (Archilochus colubris) love the red bee balm and visit every evening. A bumble bee settles in for an afternoon snooze on pink bergamot.